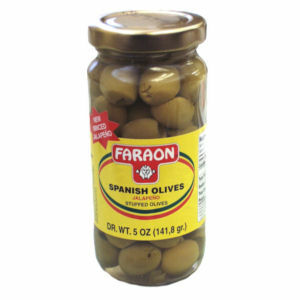 Your favorite Faraon Spanish olives stuffed with minced jalapeno peppers! Yes, these are mildly hot olives and once you've tried them you'll be hooked. What a special treat for a Friday night get together, picnics, barbeques, a special "kick" for home cooked meals, anything! Packed in a convenient five ounce (drained weight) glass jar. Ready to eat and enjoy!